This tomato peach salad is as close as I am ever going to get to actually reproducing the month of August on a plate. Right now we are at the pinnacle of local tomatoes and local peaches, and the teeny mint leaves in the picture are about as local as you can get, seeing as they are growing right outside my back door. A heap of those good things, a drizzle of sherry vinaigrette and you have the prettiest, easiest salad in town. Which is almost enough to make you forget all those back to school ads and other harbingers of, yep, FALL. 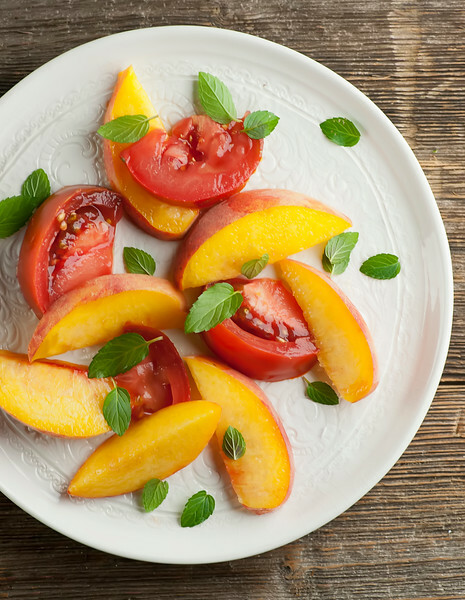 So gather up some peaches and tomatoes and let’s make beautiful salad together! 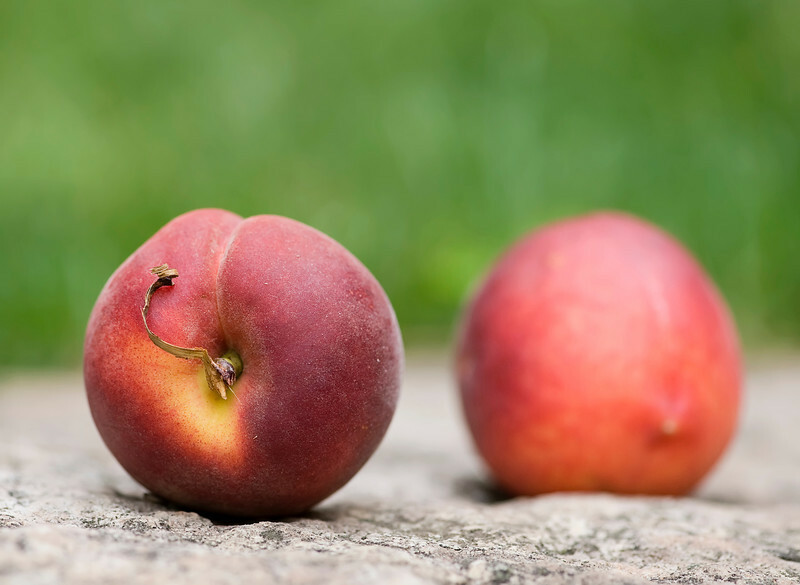 If you have a place where you can buy local peaches and tomatoes, head there to do your fruit and veggie shopping. The Southern husband and I have a great supermarket where we do the bulk of our shopping, and they have a perfectly good produce section, but we also are blessed with a big farm market that grows tons of their own veggies and fruits. So our weekly shopping excursion always includes both places, because there is nothing like home-grown. 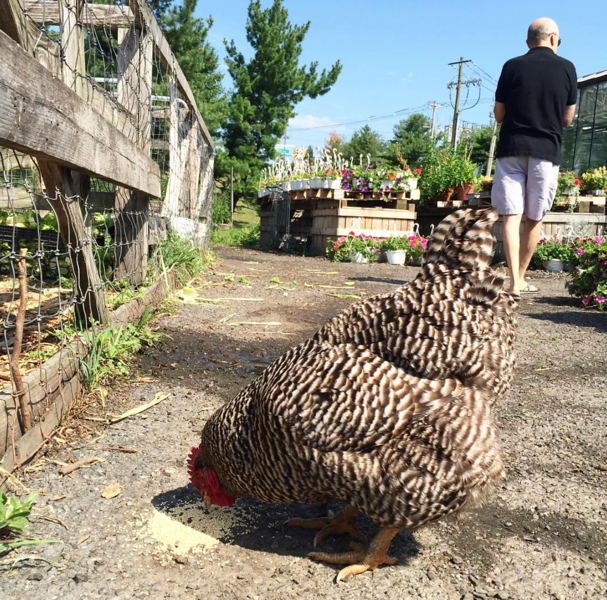 And as a bonus, we always run into shoppers at the farm market that we never see at the supermarket. I wasn’t planning to make this tomato peach salad this weekend until I saw a pile of these on a table right inside the door. Just picked. They also had a heap of these babies. Heirloom tomatoes. They are not as beautiful as their beefsteak or plum tomato cousins, but they taste Out Of This World. Rich, deep, juicy tomato flavor. Don’t judge a tomato by its cover – go for the heirlooms! …so my plans for a regular lettuce salad went right out the window. I sliced up my peaches and tomatoes, picked a handful of teeny mint leaves, shook up a quick sherry vinaigrette to drizzle over the whole thing, and 10 minutes later I had a plate of this. Summer loving, salad-style! Enjoy these lazy hazy days, all. 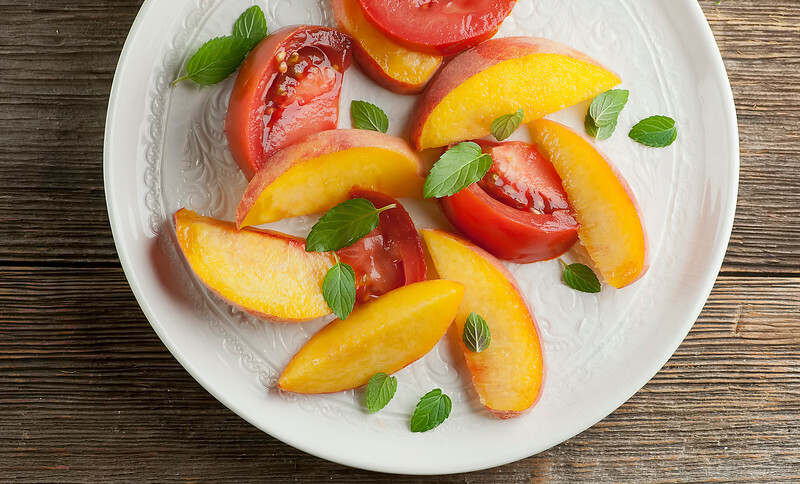 You can either put the sliced peaches and tomatoes in a bowl together, or you can arrange them on salad plates if you want to be extra fancy. Put the vinegar, oil, salt and pepper in a little jar and shake vigorously until well mixed. Drizzle the vinaigrette over the salad. 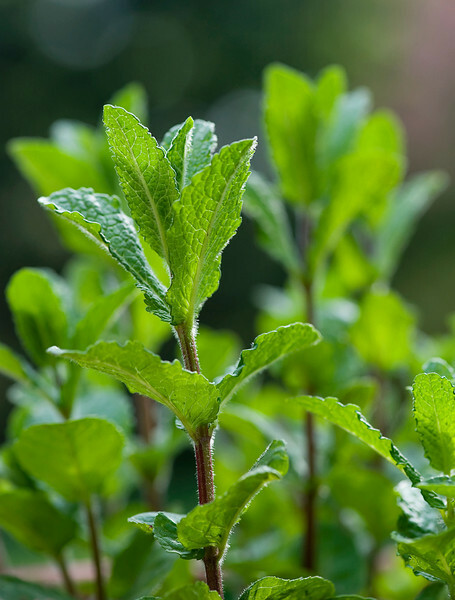 Scatter some mint leaves on top and serve. Top that salad with burrata and this is pretty much my ideal summer dinner. It’s perfect! As soon as I let dairy back into my life (post Whole 30) you KNOW I am going there! I’ve never thought to combine peaches and tomatoes before! I love your creativity! This sounds so refreshing and delicious. Can’t wait to try this! Hi Kate! I love the farmers markets that we have here in CA. Every week a chunk of our shopping is done there. Is heavenly! Thanks for your light bulb moment at your farm market.. I would love that! Hi Karen! I could spend all day in the farmer’s market – I have to keep reminding myself that two people (and one dog) can only eat SO much. :) Grilled caprese sandwich soungs like heaven on a plate!